Roger Fruci's vision of a community united by a garden is coming to fruition in the Bella Terra townhouse development. 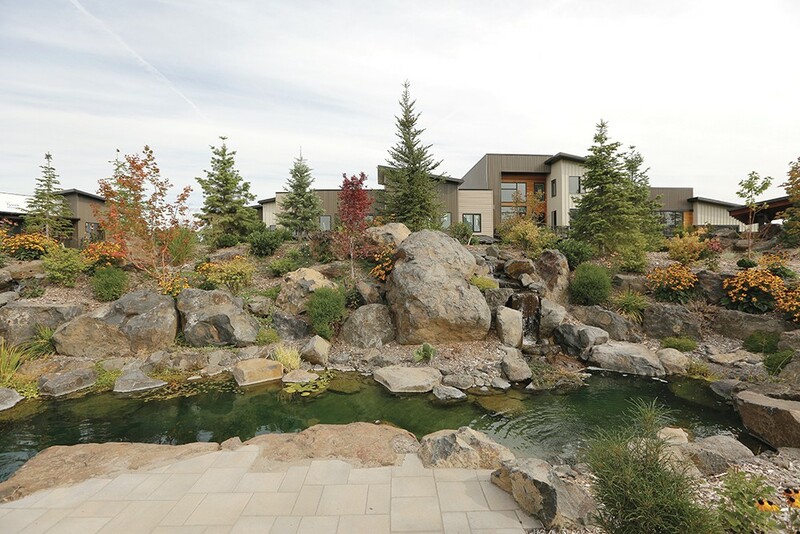 At the heart of a growing garden being built on Spokane's South Hill, Roger Fruci leans against a piece of columnar basalt, listening as water trickles over carefully placed landscaping rocks inside a semi-hidden grotto. Like ocean waves or a breeze through the trees, this type of sound, he notes, is special. Noises that are both familiar and constantly changing are enticing to people, he says. They help create that feeling of a peaceful, natural presence. "There's something about a confined space like this," Fruci says. "A lot of people, to try and get the experience of nature, they buy acreage, which is fine. They go out and they buy five or 10 acres. But most people can't do that, and most people can't afford a garden like this." But with his new development, Bella Terra, his hope is to make that natural access feasible in the city, and on a much smaller chunk of land. Bella Terra sits on 15 acres at 23rd and Havana, and Fruci's plan is for all 87 planned townhomes to have a view of both running and still water, with fruit trees and edible and decorative plants accessible to all. In a sense, Fruci says, you could call the project a form of infill. Rather than providing acres of land per family, everyone will share the benefits of the large garden at the heart of the entire project, which will be kept up through homeowners' association fees. Walking paths and stones mark the way through the landscaping, surrounded by lush green grass and filled with water features and native plants. Fruci strolls through the property on a sunny late summer day, pointing out a pond that crews dug deep into the property so it could hold trout under one of the large trees salvaged for the project. The "contemplative grotto" at the garden's core, that place where the water trickles, will serve as a private space among the shared, natural environment, he says. "Sometimes in a garden," he says, "you want seclusion and privacy so you can really settle in." Walking past several already-finished, modern townhomes, Fruci shows off the planters topping the community wall, where there are tomatoes, chard, cucumbers and a host of other veggies and fruits that residents can freely pluck and enjoy. Everything being planted now will continue to mature as the property ages. 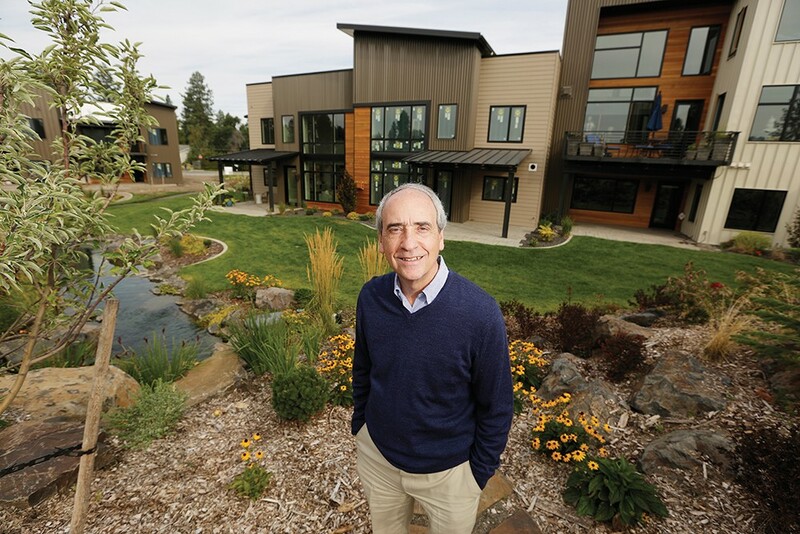 "When we finish a townhome, they're completely wonderful, they're beautiful, they're done, but the garden is just a baby," Fruci says. "But you can see even now, in its infancy, it's so gorgeous." There may be just a touch of irony that for Fruci, the garden is the key to everything. "Oh I don't garden at all, I just like being in gardens," Fruci says. "It's like someone who likes to eat, but doesn't cook." Sightlines from each residence include vistas of both still and running water. But through the years Fruci has shown that he's no stranger to taking an interest in things he didn't necessarily have experience in. Originally from Spokane, Fruci studied English composition at the University of Washington and Western Washington University. But just after college he opted to train himself in accounting by reading the textbooks on his own. He passed the test and became a certified public accountant. After years of working in accounting and as a financial consultant, he decided he wanted to do something more creative and got thinking about diving into development. So, seven or eight years ago, his garden-centered idea for Bella Terra was born. "If I was gonna do something, I wanted to do something really beautiful and cool that incorporated what I like about gardens and nature," Fruci says. "No one had ever done it as far as I knew. So I started inquiring around and finding out what are the obstacles and why people aren't doing it, and decided it was feasible, not easy, but feasible to do it." It didn't all happen at once. The property needed to be drawn up, the designs made with building and landscape architects, contractors and an interior designer. Infrastructure came first, and then, the real structural work. Now, several units are complete and a few are already home to the first residents. Designs in the community range from single-floor plans to three-story homes. Each is highly customizable, with options for high-end kitchens, floor-to-ceiling backsplash tile, fireplaces and more. With all the privacy desired, and all the community when it's wanted, Fruci says the homes are meant to appeal to all sorts of people. One of the biggest perks, Fruci says, is the ability to easily create a separate living space for a live-in caregiver or family member. Many residents will want to buy this as their "forever home" and age in place, he says, so the designers also left room for optional elevators to be added in as requested. In fact, he might choose to retire there himself. "When I thought about what kind of development I wanted to do... I thought, 'I want to live in the Japanese garden [at Manito Park], but they won't let me,'" he says. "So I thought, 'How can we create something that has that kind of feel and energy, that kind of environment, with beautiful homes?' Yeah I'd live here, because it embodies the kind of things I'd be drawn to in a community."